Reality checks! – Over the holidays last few months, I’ve put on more weight than I ever have before. 2014 was quite a year, but the fall really knocked me for a loop. I was truly shocked when I stepped on the scale last Sunday. I’m not sure why I was so shocked though. I knew my clothes were fitting me differently. Now, I would be really upset if I had to buy new clothes! I’m still rocking several jeans from high school that I LOVE, thank you very much. I like being able to fit in my sister’s hand-me-downs. This was just not okay. I’m way too tight to buy a whole new wardrobe just so I can eat dessert every night and comfort myself with chocolate and peanut butter. I got back on track big time this week by keeping a food diary through myfitnesspal. Your account is free, and the site as so many food items already in its “library” that you can search through. There is also an app for your smartphone. Organization! – I/We had a much smoother week due to lots of prep the night before. I packed lunches and made breakfasts the night before. I also picked out my outfit and H’s outfit the night before. Gym clothes were laid out in the bathroom, so I could jump right in them in the morning. Made it to the gym both Tuesday and Thursday morning. Hip hip hooray! Here is an article about how to start your work day off right that could be helpful to you as well! Greek yogurt – I’ve been enjoying Greek yogurt a couple mornings a week for breakfast. I use plain nonfat and then mix in my fruit. Yesterday, I was a little extra hungry, so I added 1/2 cup of Cheerios. The crunch was very satisfying. 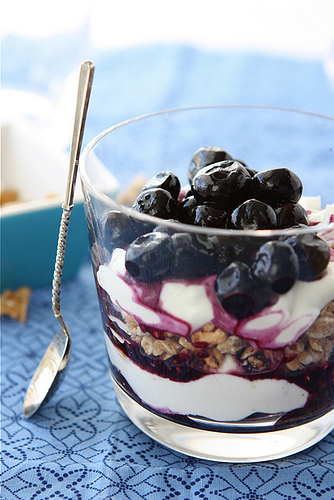 This healthy yogurt parfait picture below looks delicious. Click here to see the recipe by Cookin’ Canuck. Library Visits – We had a nice library visit this week on a chilly afternoon. Although they had removed some of the fun toys from the kids room (probably due to kids wreaking havoc while mom/dad checked their smartphone – seen it happen time and time again), we had a great time building robots, towers and rocket ships. We also used to touch screen computer to find some letters that matched. Not to mention, I got my books and DVDs along with H’s. As I write this, I’m sipping coffee. However, all this week I converted to green tea. I did this much of last week as well. I’m really liking it and feel like I’m doing something “good” for myself in the morning. I’m also shaving time off my morning routine as all I have to do is boil water. I caved in today for medicinal purposes. ← Can this be fun?